Much has been written over the years about 1939 being the greatest year in the history of cinema. And it's certainly a hard theory to argue with. After all, 1939 was the year that gave us The Wizard of Oz, Gone with the Wind, The Rules of the Game, Mr. Smith Goes to Washington, Stagecoach, Ninotchka, Goodbye Mr. Chips, Dark Victory, Destry Rides Again, The Story of the Late Chrysanthemums, you would be hard pressed to find a year as jam packed with bona-fide classics and masterpieces. While John Ford's seminal Stagecoach is perhaps his best remembered film from that year, Ford also released his very first Technicolor picture, Drums Along the Mohawk, later in the year. 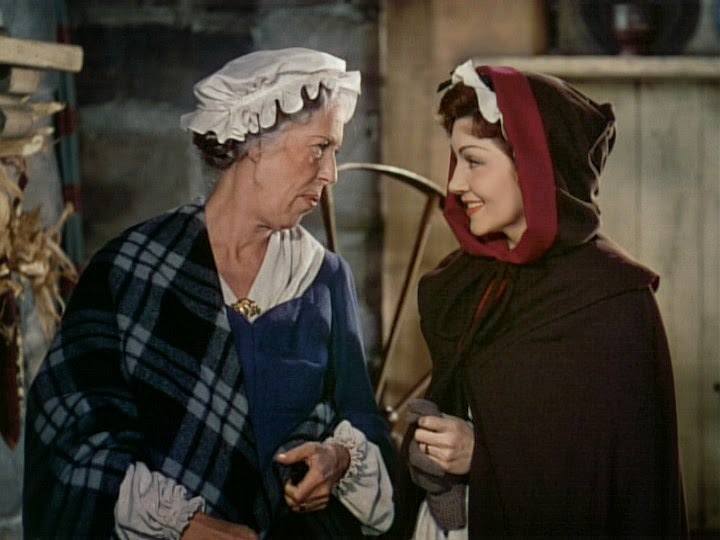 Its success at the Academy Awards was muted in the shadow of Stagecoach (and an MGM sweep by Gone with the Wind), it only managed to garner a Supporting Actress nomination for Edna May Oliver (she lost to Gone with the Wind's Hattie McDaniel). Still courtesy of DVD Beaver. 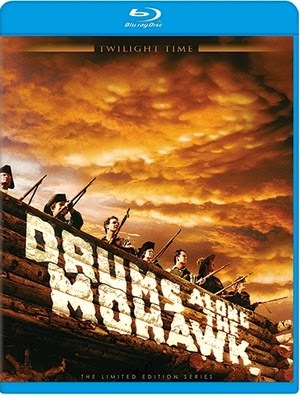 While Gone with the Wind and The Wizard of Oz are often regarded as the standard bearers of Technicolor photography, it's hard to fathom why Drums Along the Mohawk isn't mentioned right alongside them. Here is a film from a man who would give us the sweeping Monument Valley vistas of The Searchers 17 years later, flexing his considerable Technicolor muscles for the time, and the results are absolutely stunning. 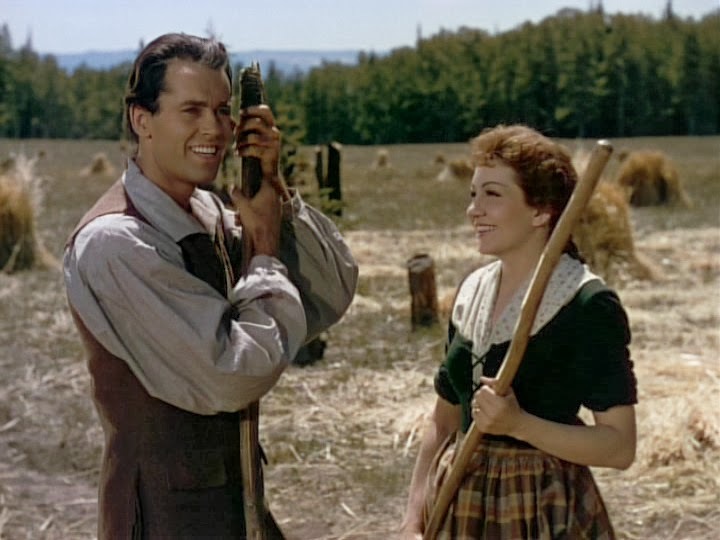 Starring Henry Fonda as Gilbert Martin and Claudette Colbert as his new wife Lana, Drums Along the Mohawk is the tale of a young farmer who takes his city-bred new wife out to the Western frontier in the days leading up to the American Revolution. Things aren't as idyllic as he'd hoped, however, as Tory sympathizers recruit local indians to raid settlers' homesteads and wage war on a new front. When their new home is destroyed, the Martins are forced to move in with a sassy, no nonsense old widow named Mrs. McKlennar (Oliver), who brings them in as hired help. But as the raids become more frequent and more fierce, Martin is called up as part of the militia, and soon the war has followed them to the frontier, where they must make one last stand in the name of freedom. Drums Along the Mohawk deals with many themes that Ford would continue to revisit throughout his career, most notably the relations between settlers and Native Americans. Here, Ford takes a Western plot and relocates it to era of the American Revolution and away from the post-Civil War era the genre often occupies. Ford never quite demonizes his indian antagonists the way many films of the time did (he also gives Fonda a native best friend), but he doesn't explore that as deeply as he would in his later films. Here they are seen as an arm of the British, and part of a greater fight for American independence, rather than an obstacle to American expansion, which is a key distinction. While the film does indulge in some stereotyping (the drunken indians who attack Widow McKlennar are especially cringe-worthy in a modern context), it does so with a surprisingly light touch. In fact Ford peppers the entire film with a warm sense of humor to balance the gravity of the plot (and the deaths of several heroic characters). His attention to detail is extraordinary, and the film isn't just a thrilling period adventure, it's a fascinating portrait of frontier life. What really sets it apart, though, is that gorgeous cinematography by frequent Ford collaborator Bert Glennon and Ray Rennahan. The recent Blu-ray release by Twilight Time (which is only available in a limited, 3,000 copy pressing) makes the brilliant colors really pop, rivaling even the Warner Brothers Blu-ray of Gone With the Wind. Pay close attention to the scene where Fonda is running to get reinforcements, a band of indians at his back, his silhouetted image against a fiery red and orange sky behind him. These are the images of a consummate filmmaker, and this is Twilight Time's most impressive package in an already pretty impressive lineup, as they continue to distinguish themselves as one of the top specialty Blu-ray labels on the market. Here, they have given their all to one of Ford's lesser known masterpieces (along with comprehensive documentary, Becoming John Ford), and given it the beautiful HD presentation it deserves. Now available on Blu-ray from Twilight Time.